Anyone who knows DorkySon knows that he is crazy about cars. You cannot step into our house without also stepping on a small, sharp vehicle of some kind. He loves books about cars, television shows about cars, standing in the living room window watching cars queuing at the petrol station across the road from us (he may have been the only person in the country delighted by the recent fuel strike debacle…). 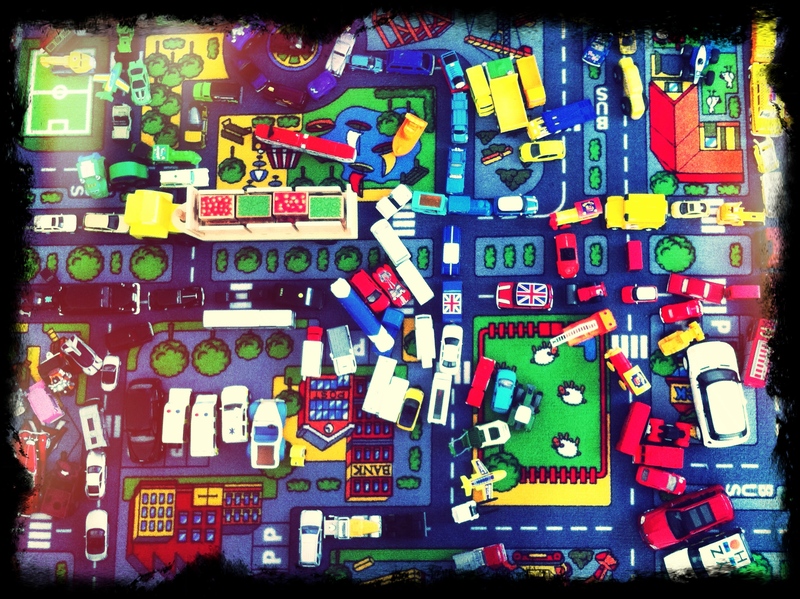 But what DorkySon loves best of all – more than any other play activity – is making traffic jams with his cars. He will happily spend a whole day lining his cars up into a traffic jam. Sometimes he’ll organise them by colour, with all the red ones at the front, and and then all the blue, and then the yellow and so on… Other times he will organise them by theme, so all the sports cars will go together, and then all the building site vehicles, and then all the airport vehicles, until finally there is no carpet left to be seen. Quite often, he will then take his ice cream truck and drive it up and down the side of the traffic jam, doling out pretend ice cream cones to all the pretend drivers in an attempt to keep them happy. Anyway, a very clever DorkyAunty and DorkyUncle have finally found a way to impose some kind of order on this traffic related chaos. For his birthday last week they bought him a giant floor rug with roads and parking spaces marked on it – and as you can see from this photo, he is getting good use out of it. DorkyMum is happy, because it limits how much floor space he is taking up. DorkySon is happy, because he still gets to organise his many hundreds of cars in whatever way he chooses. And the pretend drivers are happy because it’s easier for the ice cream van to reach them now. That organisation is pretty impressive. I love how he’s got the cars all parked up in rows. Very tidy!